Slots Random Number Generator defines how slot machine works. It is often referred to as the "brain" of the slots. The layers who don't know the basic principles of slot machine technology will necessarily fall under the influence of various myths based on false assumptions. 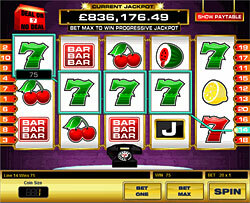 For example, many players will believe that a slot machine works due to certain cycle. According to this cycle losses are changed by wins, and the player can find out what moment is the best for the machine to hit a winning combination. In fact, the machine uses a computer chip which is installed when the machine is manufactured. It runs the program known as the Random Number Generator. Slots Random Number Generator generates multiple numbers that will correspond to certain symbols on the slot machine reels and define the winning slot machine payline. Slots Random Number Generator is actually a perpetuum mobile. This means that random numbers are generated in the slots machine every millisecond. The RNG selects a certain value somewhere between "0" and approximately 4 billion. This value is translated into a set of numbers that defines symbols on the slot reels. The winning combination of symbols is defined the very moment you push the "Spin Reels" button or even insert the coins by the most recent number selected by slots Random Number Generator. The slots Random Number generator uses a special algorithm. It is basically a set of instructions that define how numbers are generated. The accuracy of the RNG algorithm for each slot machine is checked by the special Casino Control Board. This check is performed to make sure the machine uses proper software and the player won't be cheated while playing slots. There is a certain number of spaces (22) on the reels of modern reel slot machines that represent certain symbols or a blank. These spaces are known as physical stops. Besides, with the use of modern computer technologies it is possible to use a great number of virtual stops. Let's assume that each reel of the slot machine accommodates only 10 stops. This enables 1,000 possible combinations of symbols to come out (for this we multiply the number of symbols for the three-reel machine). The possibility to get a three-number combination of symbols makes one in 1,000.This means that theoretically the player who makes 1,000 consequent spins should hit all possible combinations once. In practice it doesn't work as the more spins you make the closer you get to the actual probability, just like when you toss a coin. First RNGs were introduced to the slot machine industry in 1970s and by 1980s have changed slot machine technology dramatically. The use of slots Random Number Generator offers wide range of possibilities that were not available with classic mechanical models and totally change the slot machines odds.